Home » Cottons Library » Cottons. There’s an app for that! We have launched a powerful new app to save you time and money. 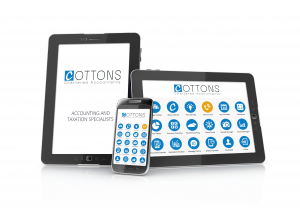 Here’s everything you need to know.Following recent announcements regarding our new, fully interactive website, and our GDPR capability, Cottons Chartered Accountants are now extremely proud to reveal that we have launched our very own app too. The new application is a continuation of our own digital transformation and has been introduced to improve accessibility to our services as well as aid our clients with their own transitions into fully digitised processes. Here’s everything you need to know about the latest advancement of our services. Why Do Cottons Need an App? GPS mileage tracker – end your struggle to keep track of your mileage. Receipt management – track receipts and expenses at the touch of a button. Never lose a receipt again! Income tracker – track your daily, weekly and monthly income. Very latest tax tables from National Insurance and Inheritance Tax to Income Tax and tax credits. Access to cloud accounting – Xero, Sage, QuickBooks. Of course, that’s a summary of what it can do but here are the key features in more detail. You can use our app to track your receipts and expenses literally at the touch of a button. With minimal effort you can take a picture of any receipt and save it to your app. Any additional information can be added later and receipts stored by amount, category, and date. When it comes to mileage tracking, half the battle is keeping an accurate tab on your journeys. Using the GPS built into in your device, it will automatically help you track mileage, enabling you to record every single trip at the touch of a button. It will also manage trips as well, storing them and allowing you to view, edit or email them with complete ease. As a firm, we’re committed to finding ways to communicate and interact with clients in the most efficient possible way. The new app enables us to send push notifications to all app users. We will be using this feature to share with your important news, deadline reminders and financial updates. You can download it now using the buttons below or by searching from Cottons Accountants in the Google Play or Apple Store. Nowadays, digital transformation is something that organisations of all sizes are managing as their operating systems are changing and consumer demands differ as we progress further into the digital era. At Cottons we are aware of this and are not only managing our own digital progression but that of our clients too. Making Tax Digital is an important government directive that is being rolled out now to make tax reporting simpler for businesses, but it doesn’t stop there. The General Data Protection Regulation, known as GDPR, is the biggest overhaul in data protection regulation for over a decade and is affecting how all businesses store and use data. To ensure that we are equipped to help, all staff at each one of our locations are Xero certified which means they are best placed to work with our clients as they move to digital and cloud based accounting systems; we even have a dedicated Cloud Accounting Team based at our Rugby office. And with regards to GDPR, our Head of I.T, Benjamin Burnett, has become qualified to assist with the changes small businesses must go through in light of the new legislation. At Cottons we are here for the journey. Our local offices provide a friendly and robust accounting service to local businesses of all sizes, while our strong network ensures that we are able to stay on top of advancements and provide our clients with what they need as the business landscape continues to develop. We have offices in Daventry, Rugby, Northampton and London too. Get in touch with your local team today, and don’t forget to download our app too!